In most countries May 1st is celebrated as Labour Day. It’s a holiday in Greece too, but it is primarily as the Day of Flowers that it’s celebrated. Wreaths of flowers are made and presented to friends and neighbours, and many Greeks travel to the countryside to enjoy the flowering landscape, with bunches of flowers stuck under their windscreen wipers. Molyvos was flooded with mainly local tourists, even though it is no pastoral field full of flowers. The little town is a beloved destination for people going out for a day-trip. It has lots of green spots within its old stonewalls and so has its own beautiful flower spots. Travelling from the capital to Molyvos will lead you along colourful open fields and lots of orchards where beneath the light green olive leaves lie fields of flowers in all colours. These days the island is at its colourful best and it is the nicest time to take walks or outings by car. Close to Achladeri you will find famous fields, which are easily as beautiful as the Dutch tulip fields: the red of the poppies is an attraction for many photographers. Even just a few of these bright red flowers in a green field can tempt plenty of people into stopping on the roadside. Most people know that poppies are not just flowers to colour gardens or fields: opium can be made from them: a drug that can relieve pains, numb your state of mind or bring you to a sweet sleep. It can lead you to addiction and also may kill you. The Roman emperor Marcus Aurelius, the English writer Charles Dickens, the movie star Bela Lugosi and even the world famous nurse Florence Nightingale were opium addicts. And many others too, since opium has been known for thousands of years. In ancient Greece, their Gods for sleep (Hypnos), night (Nyx) and death (Thanatos) were often depicted with a poppy as their symbol, as were the Gods Apollo, Asklepios, Pluton, Demeter, Aphrodite, Kybele and the Egypt Goddess Isis many times seen with a bunch of poppies, sometimes mixed with some ears of corn in their hand. But it was only in the 8th century BC that poppies were mentioned for the first time in writing. Hesiod mentioned the city of Mekone (Papaver-city, in the region of Corinth), where Prometheus gave portions of poppies at an ox to sweeten the mind of Zeus. Theophrastus later wrote that a combination of the juice of poppies and hemlock (Conium maculatum) gave a painless and easy death. In the Odyssey, written by Homer, the juice of poppies is used to numb people in order to have them forget all sorrows. Aristotle recognized poppy juice as a drug and both Hippocrates and Theophrastus wrote about different kind of poppies and their applications. Proof that the Greeks in ancient times were already using this flower for healing or enjoyment comes from archaeological finds. On Crete a small statue was discovered of an unknown woman from Minoan times. Her hair was adorned with poppy-capsules. That is why the archaeologists named her as a Goddess of Poppies and healing. 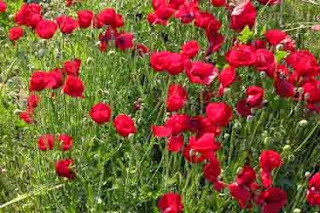 But all over Greece poppy-capsules were depicted on many more finds, so a conclusion can be made that opium was a very old drug, known by priests, kings, Gods and other mighty people who knew very well how to use it. the opium poppy (Papaver somniferum), also called the Common Garden Poppy, has a light green stem and its flowers vary in the colour from white to pink, purple and dark red. She may be found on the island, but not in sufficient numbers to provide an opium kit. The most common poppy on Lesvos is the red Papaver rhoeas, also called corn or field poppy, Flanders poppy, red poppy or coquelicot. You may also find a smaller variation: the Papaver argemone, called the long pricklyhead poppy or pale poppy; and even another pale poppy, called the Long-headed poppy or Blindeyes (Papaver dubium) is to be find on the island. And some of the coasts are brightened by a yellow kind, called a horned poppy (Glaucium phoeniceum). I think there might be some opium addicts on the island, but for sure this drug is not produced on the island. Even though the common garden poppy was plentiful during ancient times in Greece, nowadays it is hard to find. Maybe that’s the reason that the seeds of these flowers – the delightful poppy seeds – are mostly unknown in Greek food; although you may find some bread decorated with poppy seeds. In earlier times they had babies calmed down or encouraged sleep with some drops of the field poppy (which also contains, but in very very small amounts, some drugs). But nowadays I am not sure if mothers would dare to use this to sooth their children asleep. Here on the island lots of green leaves picked in nature are very popular as food: the so-called chorta, like dandelion, Milk Thistle or nettles. There are many wild grasses loved by the Greeks, whose leaves are picked when the plants are still young and finish in the kitchens where they are used for super healthy dishes. The leaves of the long pricklyhead poppy also are an edible chorta. These can even be eaten raw, provided that they are picked before the capsule has grown. In a small tavern in Agiasos last week they not only served fresh picked Morchella (another culinary surprise), but also Poppy Balls: not containing opium, of course. But you do not need any opium to get addicted to Greek food, especially when you find such an eatery where they serve so many products, fresh from nature, which they turn into delicate dishes.